This cake was made for no particular occasion. My colleague wanted to be a nice grandma for her granddaughter, and ordered a doll cake. 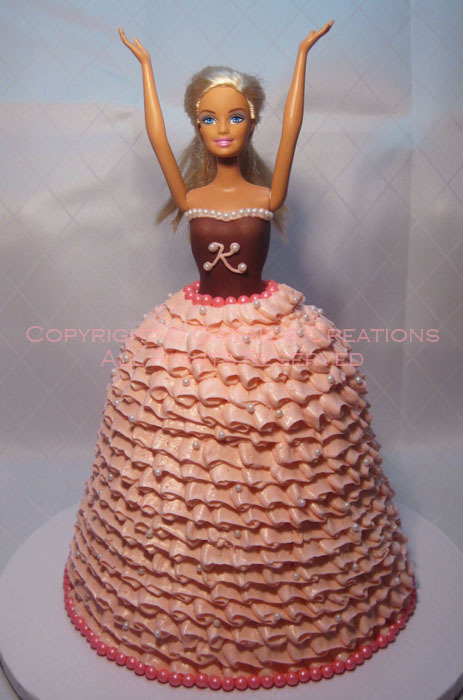 Why were Barbie's arms raised? Well, the text that was on the cake board said "Soccer Star Kendra" because the little girl is into soccer, so I thought it would be funny for Barbie to allude to the "gooooooooooal!" stance that many players use. This was my first attempt at a doll cake. I didn't get a special pan (I was considering it) but used two 8" rounds and two 6" rounds. The chocolate cakes were stacked and chocolate Swiss meringue buttercream were iced between the layers, then carved down to a dress shape (so much cake was lost... but, I plan on making some form of cake balls out of them - I hate wastage). Then, I made a hole in the cake and dug out some cake. I plastic-wrapped the doll from hips down and inserted her into the opening. The bodice was made with chocolate fondant and decorated with pearls. Finally, ruffles were piped with pink vanilla Swiss meringue buttercream with pearls randomly throughout. For New Year's Eve, my colleague requested a vanilla/chocolate cake with vanilla Swiss meringue buttercream icing. 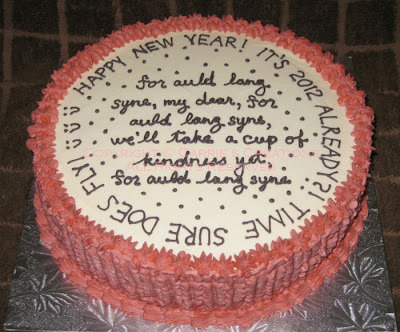 No theme in particular, so I wanted to do a more text-y cake. 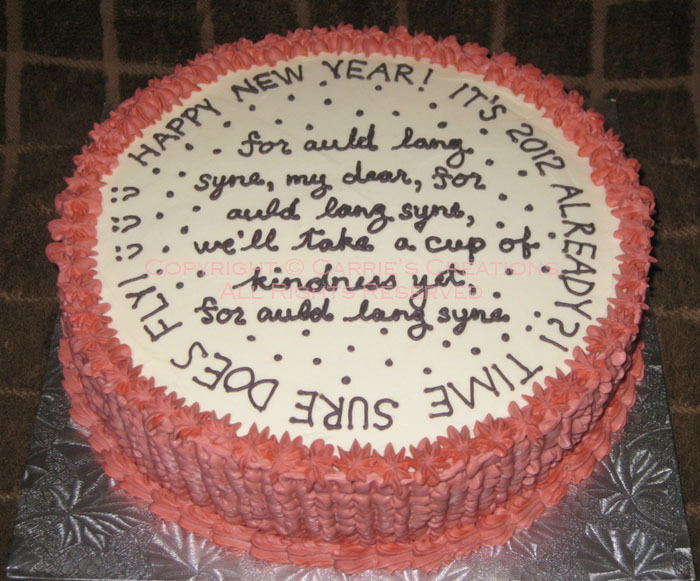 I decided on a few lines from the classic song that is sung to ring in the new year.